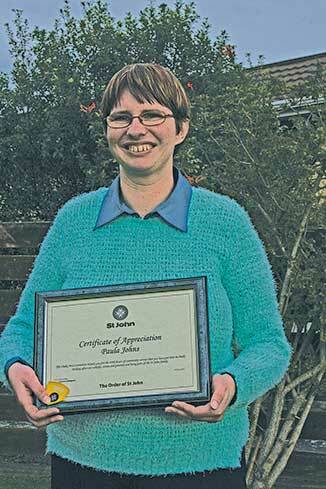 After giving her services to the Order of St John volunteer wing for 20 years, Paula Johns has finally received her badge and certificate acknowledging her 1000 hours assisting at events around the wider Otaki region. Paula began as a cadet when she was 12, and with the late Georgie Naef and Leo Ruston, attended mainly the race meetings and rugby games in Otaki. Later she assisted at other events when the events vehicle was in attendance. As the ambo’s went to more events, Paula went too; the Waitohu Fireworks Extravaganzas, Manakau Medieval Markets and Manakau Shows, pony club days, jump-outs (gates training for beginning race horses) and a wide variety of events around Otaki. Her main role was the “goffa” carrying the buckets of “magic water” and collecting anything that may be needed. As a junior cadet she had worked for and earned 10 service badges, as diverse as first aide and fire safety to child and animal care, communications and community awareness. She did all this at the same time attending all the rugby games and race meetings held and completed her 12 year service badge in 2011. She also earned her 100 hours, 200, 500 and 800 hours public service badges over this time, completing 1000 hours in April this year. Most of the hours were in blocks of two to five hours. Her final hours were completed in keeping the St John rooms clean and tidy. Being a St John volunteer had been a very big part of Paula’s life. Sadly following Mrs Naef’s death, the cadet wing closed. Paula was told she would be unable to do any more public duty as she is unable to train for higher qualifications. The only time she can now don her beloved uniform will be as an official collector for the annual Order of St John appeal. Her St John work was the only thing outside home Paula did and she thoroughly enjoyed it, “It was her world,” her sister, Rebecca Watson said. Paula celebrated receiving her certificate and badge with family and friends on Sunday July 26. But Paula is out on her bicycle two days a week delivering the papers around the plateau area, the most trustworthy paper deliverer around, residents say they never miss a paper.